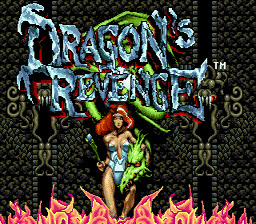 Dragon's Revenge is the sequel to Dragon's Fury. That being said, this one doesn't look quite as good as Dragon's Fury, I think. The colors are a bit dark and the picture is grainier. Still, it's another pin ball game that's incredibly fun and well worth a try. Obviously, they tried to put a lot more detail in this one. Personally, I think it's too dark and I prefer the brightness of the first one. The music isn't as great either. WAIT! Don't leave! I really do like the game! O.K.? So I felt that I had to contrast the two... I'm done now and want to say that this game is awesome. I love pin ball games, and this is one of the best I've played. Just like Dragon's Fury, I found the controls on this to be a bit strange, but I did get used to them after a while. For Dragon's Fury it was difficult to get a fast reaction on the D pad for the left flipper, but I found that it was just as quick as the buttons on this game. So I left the controls alone this time, but you may want to change them. You can change them by selecting Options before starting the game if you like. Set them as whatever you would normally feel comfortable with for a pin ball game. Just as in Dragon's Fury, you have bonus stages. Kill all of the monsters in a section of the screen and you will open up a portal to a bonus stage. There are three sections. The top has a skull and a crystal. Hit the skull and the screen will go dark for a second. Then enemies will begin to come out of its mouth. Kill them all and you can then shoot the ball into the skull's mouth to get to a bonus stage. Flip the ball into certain warp points also, and you will be taken to a bonus stage where you have to face some sort of monster. Defeat the monster (or monsters) by bashing them repeatedly with the balls. Then a ball will float down from the sky. This ball represents a warrior that you free by breaking the ball. Breaking it brings this warrior to your aide. The warrior will become a special ball for a short time that you will be able to use in the central game. There are a few different types of special balls available in the game that you can get by performing certain tasks. Each ball will multiply your points in a different way. You will hear a voice that tells you how many times the points will be multiplied with each special ball as you get them. Here are a couple of examples of the Bonus Stages and how to get to them and through them. There are many more! In this stage you will have 3 balls. Hit them into the crow that keeps sticking his head out of the mountain while harpies and the tentacles of some sort of creature living in the water try to deflect your ball away (and possibly right down the drain). Get into this stage by going into the mouth of the dragon at the bottom of the screen (if you have already defeated the snake it will not be here next time, instead there will be a different monster). In here you will have to hit the snake that is in the center/top of the screen. After a few hits he will explode and there will be a bunch of spikey things on the screen. Explode each of these by hitting them. Then the snake will reappear one more time and you will have to destroy him again. Defeating him will not bring around another hero ball (those orbs with heroes faces on the front) to break. You may have noticed new pictures of the heroines (and hero) being added to a screen after you complete the bonus stages (and break the ball with the picture of each herione/hero). Completing this one will fill in the snake with color. The object is to fill the whole picture. You still get a special ball from defeating the snake, just like you would in other stages where you break a hero ball. There are also some special places on the main screen where you can really rack up some points. One of these places is located to the left of the screen and can be gotten to by shooting your ball all the way up to the very top left. This can be difficult to manage, but if you do your ball will go down a chute that has three hearts in it. As you pass over a heart it will turn red. Turn all three red and you'll get mucho points. You can move the red hearts around and switch them to make sure that the section the ball is going through is one that hasn't turned yet by pressing the flipper buttons. If the ball passes over a red heart again the heart will return to normal. If your ball drops out of the bottom of the screen on the main screen you will lose a ball. However, if it drops out on a bonus stage you will simply be taken back to the main screen without having completed that stage. Extra balls are awarded in a few different ways. Sometimes it's points, but sometimes you will have to do something special to get them. Two players simply alternate each time one player loses a ball. Can you defeat the evil dragon lady?